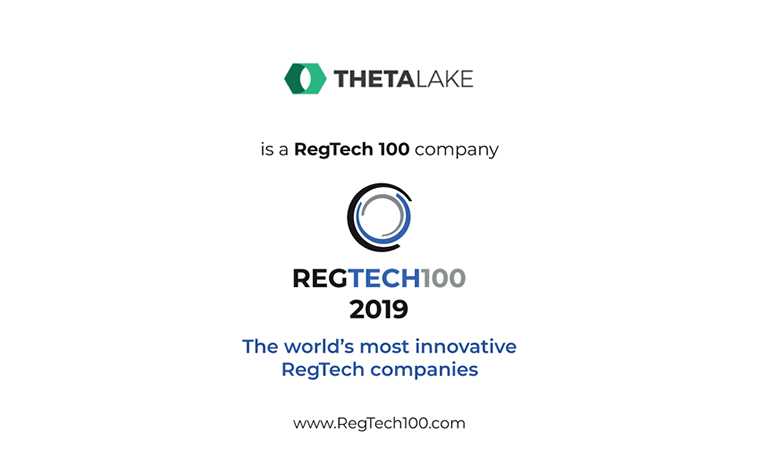 San Mateo, CA – January 15, 2019 – Theta Lake, a leader in compliance artificial intelligence (AI) for video, voice, and unified digital communication, today announced its first round of institutional funding and its industry recognition as a pioneer in the RegTech market. Theta Lake’s platform uses AI to help compliance teams more effectively scale their compliance risk detection and workflow for supervising communication on modern video, voice, and unified collaboration systems. Theta Lake’s significant momentum and innovations in AI for compliance caught the attention of Neotribe Ventures when considering investment opportunities. Theta Lake will use the new investment to develop its platform and increase its market presence, including immediately hiring new team members for its California offices in Santa Barbara and San Mateo. The RegTech 100 list recognizes pioneering companies that are transforming compliance, risk management, and cybersecurity. FinTech Global analysts and industry experts recognized companies that demonstrated innovative use of technology to solve a significant industry problem, or to generate cost savings or efficiency improvements across the compliance function, according to Mariyan Dimitrov, head of research at RegTech Analyst.